← Out in Reel Film Series begins April 10! 3rd Annual Rainbow Lecture Tonight! 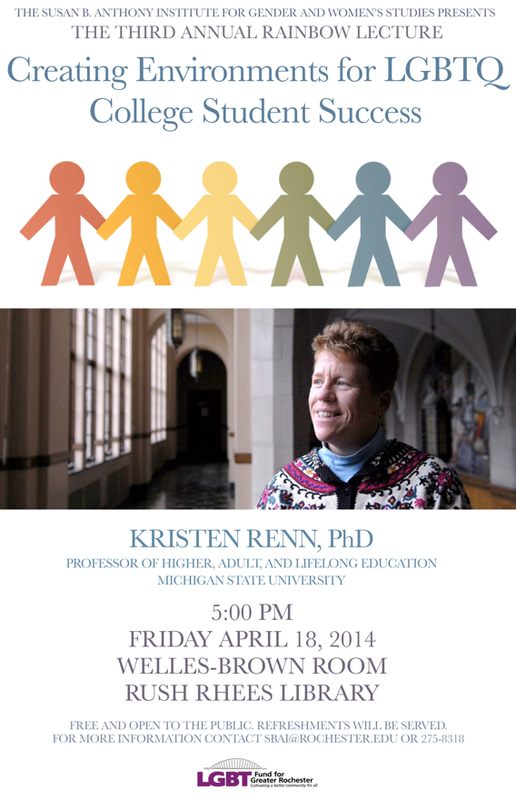 We are looking forward to this evening’s Rainbow Lecture with Kristen Renn, PhD, Professor of Higher, Adult, and Lifelong Education at Michigan State University. Dr. Renn will present “Creating Environments for LGBTQ College Student Success”. The lecture will take place at 5:00 pm in the Welles-Brown Room of the Rush Rhees Library. For information on parking at the University, please visit the visitor parking page of the University website. Dr. Renn’s research centers on identity in higher education, with current projects focusing on bi and multiracial college students, lesbian, gay, bisexual, and transgender college students, a national study of new professionals in student affairs, and a study of women’s higher education institutions around the world. We are so pleased to have her with us today and hope that you will join us for the 3rd annual Rainbow Lecture! The Susan B. Anthony Institute for Gender and Women’s Studies would like to acknowledge the generous support of the LGBT Fund for Greater Rochester for the 2014 Rainbow Lecture.